Brand New! There is a webkinz trading cards sale. Most of you probably have the first series of trading cards. Trading Cards Series II are new basic cards. You will get 85 cards that display new characters. One new character is the Persephone. This is the high fashion poodle from Supermodelz and the Kinzstyle Shop. 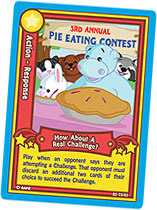 Each basic card can be used with the Challenge Game. Another added attraction to the Series II are Action Response Cards. You can use these cards to stop your opponent quick. The Action Cards will make all the challenges very hard for your opponent. This series of cards will make your game more fun. Check it out!